Well look what we have here. 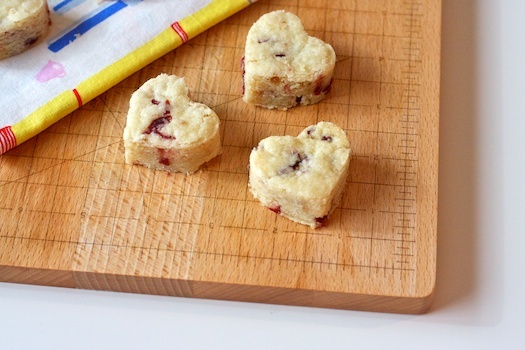 The obligatory heart-shaped baked good post for Valentine’s Day! Half of you are already clicking to the next blog entry in google reader and the other half are still with me. Thank you second half! There’s nothing wrong with loving pretty things, cookies, or cutting them into girlie girl shapes. As you’re probably aware I’ve made lots of heart-shaped things in the past and quite enjoy doing so whether it’s a goofy holiday or not. This lovely little recipe was particularly pleasing though as I didn’t have to cover my one square foot of usable kitchen counter space with flour, fight off Dexter the cat’s constant curiosity, and then try to roll out dough. 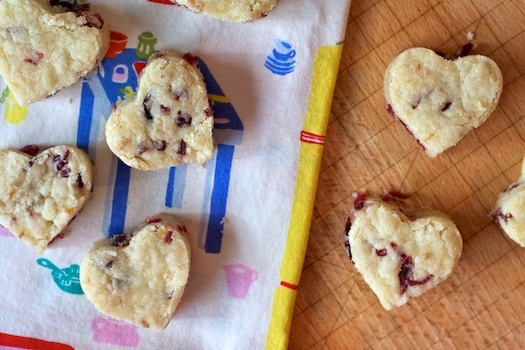 In fact, you don’t even have to turn on a mixer to make these addictive little sweets. Conjure up a medium sized bowl, a wooden spoon, and a square baking dish and you’re good to go. My one suggestion would be that you definitely prep your baking dish, preferably with parchment paper. But if you’ve run out and keep forgetting to buy more, like me, aluminum foil liberally plied with cooking spray does the trick in a pinch. 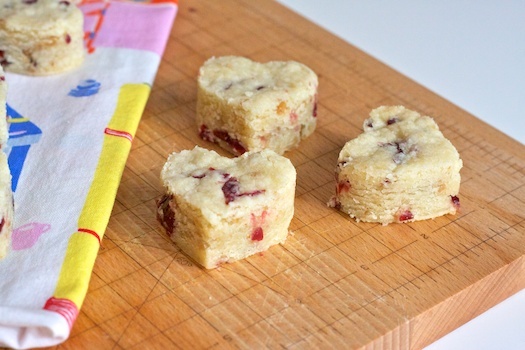 Of course, this bake and then cut method does leave behind an interesting array of oddly shaped scraps. The’re quite ugly but you can give the pretty well-formed hearts away and keep the discards at home. Waste not, want not! Plus, I assure you that they’ll taste just as scrumptious in a small neat pile next to your afternoon cup of tea. If anyone gives you a weird look just say they’re something funky you found on Pinterest. No one will even bat an eye. That is so this decade’s defining statement! 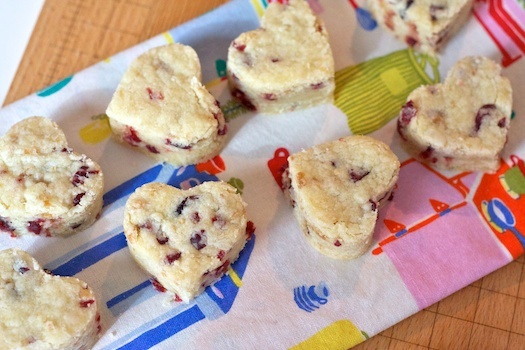 Beautiful shortbread, hearts or otherwise. I love these cookies! I made them last Christmas and they are so simple and delicious. They’re also good with different dried fruits and flavored extracts. I made a blueberry-lemon version that was great. Blueberry-lemon be stil my (ha ha) heart 🙂 That sounds heavenly! I really want to make them with mini chocolate chips too. Such a versatile recipe. Sometimes Martha Stewart deserves real props — or her assistants do. And what an interesting technique–cutting the cookies *after* baking. Wish I had some heart-shaped cutters to try it out. I am totally making these. I love anything with the word shortbread in it!!! They’re super easy. I definitely think you’ll like them. PS: Do my brightly colored napkins look familiar to you 😉 I of course still use and love them! Do you remember who designed that fabric? They look delish!! CK is a lucky boy!!! First off… cutest tea towel ever! Second, these look amazing. Perfect for tea. I’d love to throw a little orange zest in there. Yum! These are adorable. 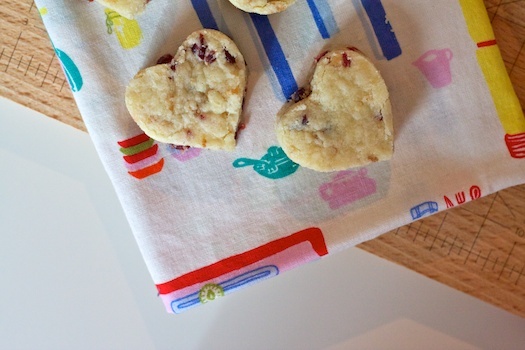 I just found myself wishing I had a heart-shaped cookie cutter the other day, and now even more so. I think we should eat heart-shaped items all year long! Can’t wait to try these out. ive been wanting to make these. do u think theyd taste better w/ white chips added to the dough or would u leave them as is?? I think white chocolate would be a great addition. If you can, I’d try to cut up a white chocolate bar into small pieces rather than use chips but that’s only because I’m not a big fan of the way white chocolate chips taste. Happy baking!